Are you ready for a new song? So here it is. “With our second single “Chapter 666 (We are the hammer)”, we take you once again to the Warhammer 40k Universe. This time, we join the ranks of the Demon Hunters of the immortal Emperor of Mankind – the Grey Knights of the Space Marine Chapter 666. We’re glad to announce that we will support Korpiklaani on their spring tour in 2018. Together with our labelmates The Privateer we will join them for some weekend-shows. Black Messiah, Arkona, Heidevolkand Trollfest are on the billing as well. The first one will be the opening track “Empire Rising” and will be released on September, 15th. The second song and appetizer for “The Great Brotherwar” will be released on October, 13th and is called “Chapter 666 (We are the hammer). As usual we appreciate your support and encourage you to share this post on your wall and/or with your friends to spread the word. The Germans have finished their new masterpiece „The Great Brotherwar“. The new album will be released on October 27th via NoiseArt Records. We are happy to be finally able to announce the worldwide release of our new record “The Great Brotherwar” through NoiseArt Records on the 27.10.2017. We know that many of you waited for a long time for our new album. There were many obstacles to take and, despite the long time, we faced a lot of stress when the deadlines started to appear on the horizon but today we can proudly put an end to your waiting. And we promise: it was worth the wait for “The Great Brotherwar”! For the recordings, we retired to our own Evertale Studios again to work on the songs until the end. The drums were recorded by Christoph Brandes in the Iguana Studios in Freiburg again. He also did the Mix & Mastering for the entire record. The Tracklist and the albumcover, made by no one less than the living legend Andreas Marschall, will be revealed next week. Stay tuned! Heute haben wir zwei wichtige Neuigkeiten für euch. Wir müssen mitteilen, dass Tyronne Silva nicht mehr zum Line Up von Evertale gehört und können im gleichen Zuge Wombo als neuen Mann hinter den Kesseln vorstellen. 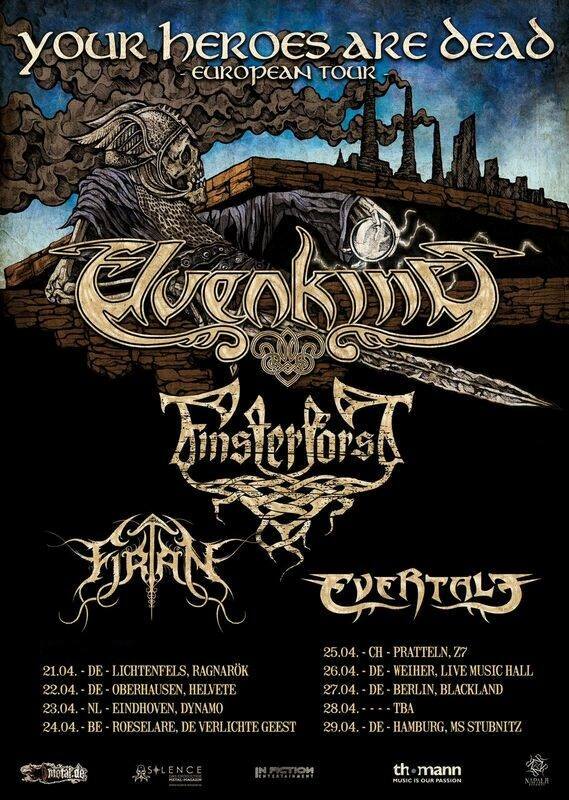 Wombo hatte seine ersten Auftritte auf unserer Tour mit Elvenking. Wer dabei war konnte ihn bereits kennenlernen und seine Künste am Schlagzeug erleben. Mehr Informationen und Fotos werden folgen. Weiterhin können wir mitteilen – das lange Warten hat ein Ende – dass unser neues Album mit dem Titel “The Great Brotherwar” Ende des Jahres 2017 über NoiseArt Records erscheinen wird. Bleibt uns gewogen, viele weitere tolle Neuigkeiten zum Album und auch Konzerten werden folgen!Today we have two important news for you. We have to announce that Tyronne Silva is no longer part of the line up of Evertale and can introduce our new drummer Wombo, who will complete our line-up from now on. He had his first appearance while playing the drums on our tour with Elvenking and more news and pictures will follow soon. 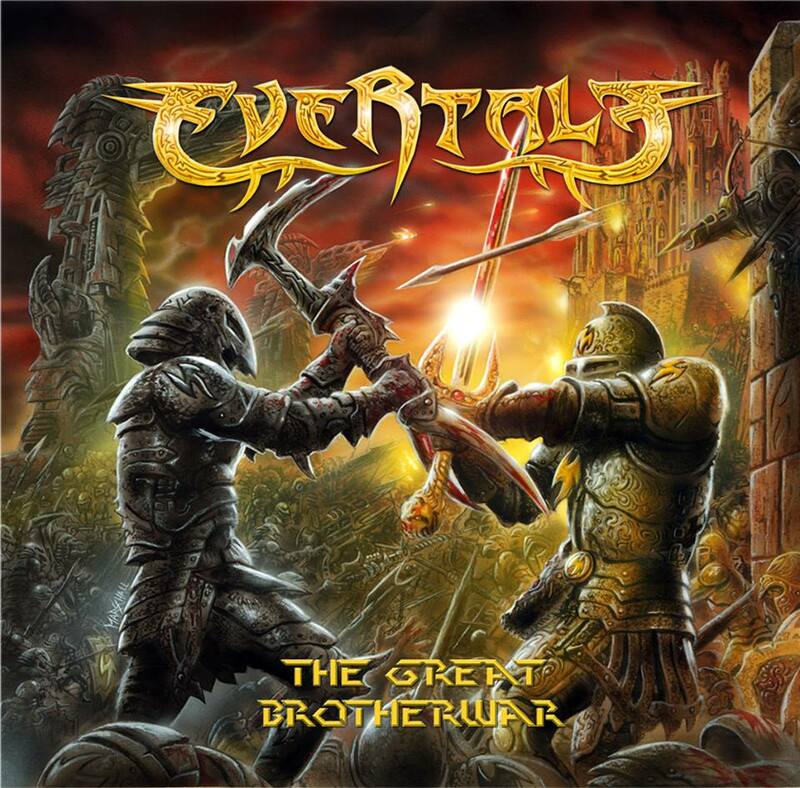 And – the long wait has come to an end – we are happy to announce our new album, entitled “The Great Brotherwar”. This will be released in the second half of 2017 via NoiseArt Records. Stay tuned more news about our new album and new tourdates will follow soon! Eine kleine zusätzliche Information für alle Evertale Fans. Evertale werden nicht am Ragnarök Festival spielen und werden dann ab 22. April bis zum letzten Konzert in Hamburg Teil der Tour sein. Bitte erscheint frühzeitig, Evertale werden als erste Band die Bühne entern. Ich hoffe wir sehen uns an einer der Shows der Tour.Just a small additional information for all Evertale fans. Evertale will not play on the Ragnarök festival and will be part of the tour from 22nd of April until the last show in Hamburg. Please arrive early, Evertale will play first. I hope we’ll see you on one of the shows from the tour. Liebe Freunde, lange Zeit war es ruhig um EVERTALE, aber natürlich waren wir nicht untätig. Wir haben an neuen Songs für den Nachfolger von “Of Dragons and Elves” gearbeitet. Dieser wird dieses Jahr wieder über NoiseArt Records veröffentlicht. Mehr können wir zum derzeitigen Zeitpunkt zwar noch nicht verraten, aber die nächsten News werden sicher nicht lange auf sich warten lassen. Behaltet diese Seite einfach etwas im Auge ;-). Ein kleines Video haben wir dennoch für euch gemacht. EVERTALE werden natürlich auch im Jahr 2017 live präsent sein, wir arbeiten derzeit an den ersten Dates. Es wird im Frühjahr wohl eine kleine Tour geben und natürlich einige Open-Air Shows. Dear friends, there was a long silence around EVERTALE but of course we weren’t inactive. We were working on new songs for our second album, the successor of “Of Dragons and Elves”. The album will be released that year by NoiseArt Records. Up to now we can’t reveale more details but be sure that more news will follow soon. Just keep an eye on this page and stay tuned for more ;-). Nevertheless we made a little video for you..
EVERTALE will of course be present on stage in 2017 as well. We’re working on some tourdates right now. We’ll do a little tour in spring and of course play some Open Air shows as well. Hope to see you there, guys! Wir sind erfreut euch die endgültigen Tourdaten für unsere Tour als Special Guest von Majesty bekannt zu geben. 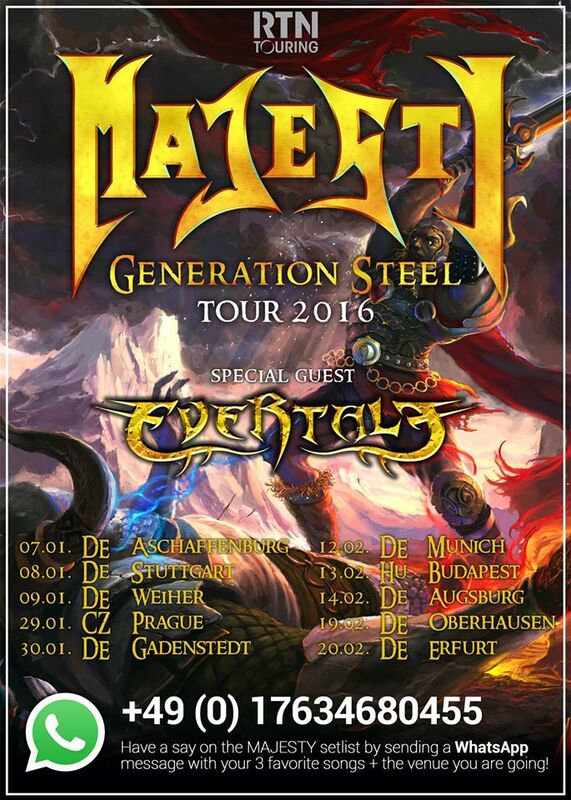 We’re happy to announce the final tourdates as Special Guest of Majesty.